No-bake shortcake squares? Sure! 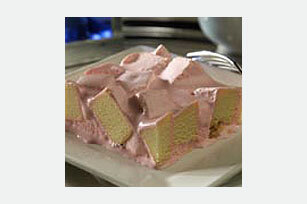 Get out a prepared pound cake and some on-hand ingredients to make this easy, crowd-pleasing strawberry dessert. Mix whipped topping, ice cream and dry gelatin in large bowl until well blended. Add cake cubes; mix well. Freeze 3 hours or until firm. Cut into 15 squares to serve. Store leftover dessert in freezer. Serve your guests this cool dessert at your next gathering. All will love this refreshing variation of an all-time classic recipe. Prepare as directed, using 2 pkg. (4-serving size each) JELL-O Strawberry Flavor Gelatin.